Art at the time turned to reflect this struggle, showing women sewing in sad little rooms, poor and desperate. Whilst feminine sewing had been seen as a proper pastime for lovely ladies, it became more apparent that for some it was matter of life and death, most probably death. So you would hope that 50 years later, things would have improved for home-sewers. Enter Ann and Emily Lockyer. 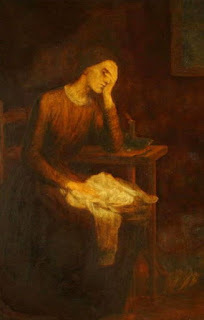 Ann, 60 years old, was the widow of a cabinet maker. 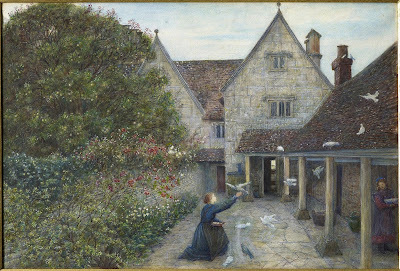 Until the 1890s, the Lockyers had been reasonably comfortable in their work, and Ann was described in the census returns as a ‘Tailoress’, which suggests a certain level of skill. Mr Lockyer had learnt the trade of cabinet making from his father and he, unlike his wife, was literate and of a certain standard of education (if the marriage register is anything to go by). 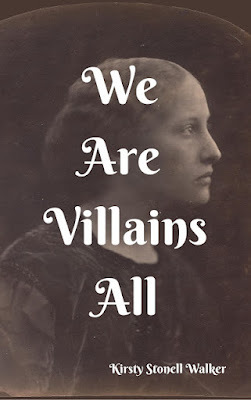 They lived in Bethnal Green, raising their children and leading a decent, uneventful life. They worked for Shadrac, Schneider and Sons, a wholesale clothing manufacture of Durward Street, Bethnal Green. Emily seems to have been the main employee because it was she that took in the pairs of trousers for ‘finishing’. Finishing entailed a sewer putting on buttons, hemming the garment, sewing in bands and pockets and that sort of thing. 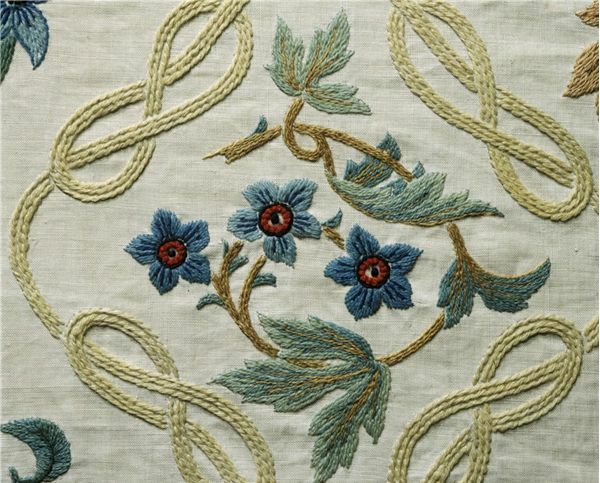 For each garment ‘finished’ the women received 2d, which equates to around 48p of today’s money. When several of the pairs of trousers did not arrive back at Shadrac, Schneider and Sons in October 1902, they sent the police round to Ann and Emily’s rooms and found the pawn tickets relating to four pairs that Ann had taken to the pawnbroker. The two women were hauled up in court on 15th October 1902 and it was reported in the Daily News the day after. Such emotional pleas fell on deaf ears. 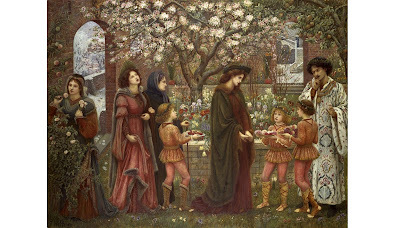 In response the Magistrate, Mr Cluer (probably not on 2d per case) said ‘it might be starvation, but it was not sense to throw away the chance of earning even the small sum they got.’ They were each ordered to pay 10 shillings, an equivalent of around £28 or serve five days in prison for unlawful pawning. They were taken off to prison because where on earth would they get 10 shillings from? 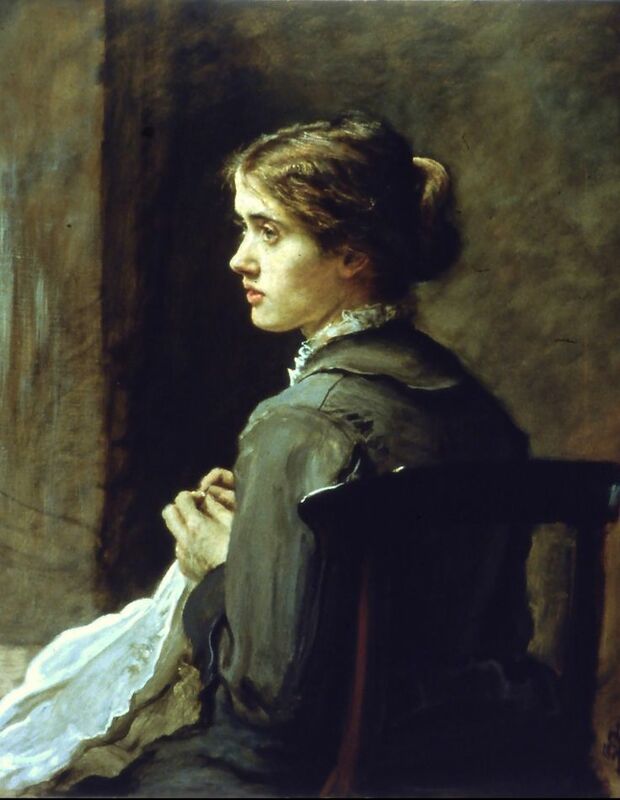 The reason I found this so surprising and touching is because we often think of Jane as quite aloof and uninvolved in real life. 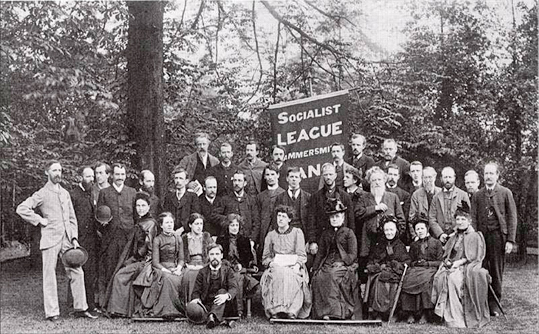 While her daughters and husband held the Socialist banner high, Jane is conspicuous by her absence and it has struck people as noteworthy that she did not involve herself as wholeheartedly as May, for example, in pursuing and upholding her husband’s principles. 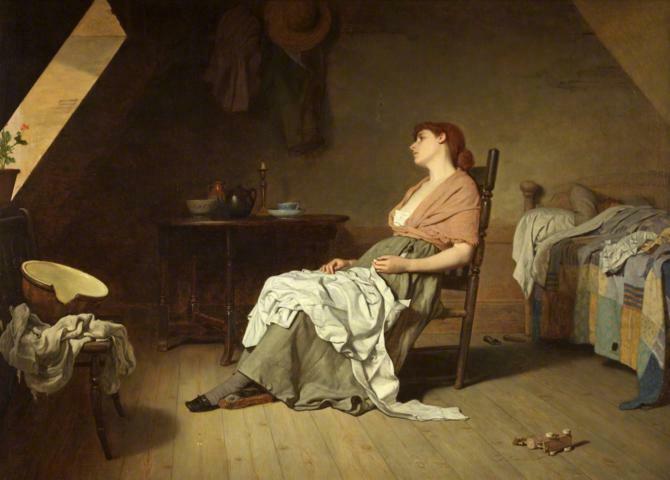 …others were also sewing, but in ‘slow starving’ and squalor. Whatever her reasons I think I appreciate Jane Morris a little bit more today because of it. 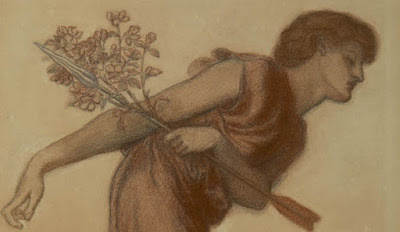 The slanging match that erupted over the works of Burne-Jones exhibited at the 1879 Grosvenor Gallery exhibition is puzzling and funny now but must have left many people smarting as the establishment and the new crowd clashed over what was 'good taste' and who should dictate it. 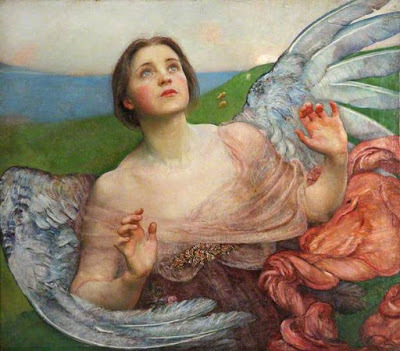 Looking at pictures like The Annuciation and the Pygmalion cycle it's hard to see why people reacted so badly but the very public scrap tells us much about the artistic scene and how much people had invested in it. As you will probably know by now, I love finding the graves of artists and models and am currently after another one to show you at some point. I'm glad to know that I'm not alone in this pasttime and it is lovely to hear from you when you go and see the final resting place of someone we've talked about here. 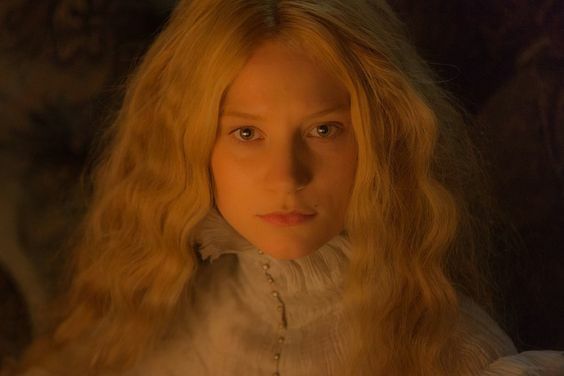 I seem to have spent a lot of October at the cinema and reading as I reviewed Suffragette and Crimson Peak (both spankingly good films) and read The Looking Glass House all of which I enjoyed. 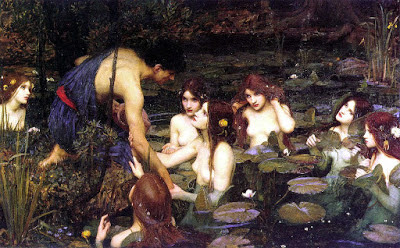 I talked about poor old Alfred, Lord Tennyson dying, and my weakness for man damsels expressed through images of Hylas and the Nymphs. Flipping heck! I wrote another book! Huzzah! Thanks to everyone who has read and reviewed my novel and please, if you enjoyed We Are Villains All, pop a review on Amazon or Goodreads. You might just encourage someone else to read it and that in turn means I can afford more gin and stockings. December can only mean one thing, Blogvent, but last year we had Muffvent instead as apparently I'm not innuendo-filled enough. I blame you lot, you saucepots. 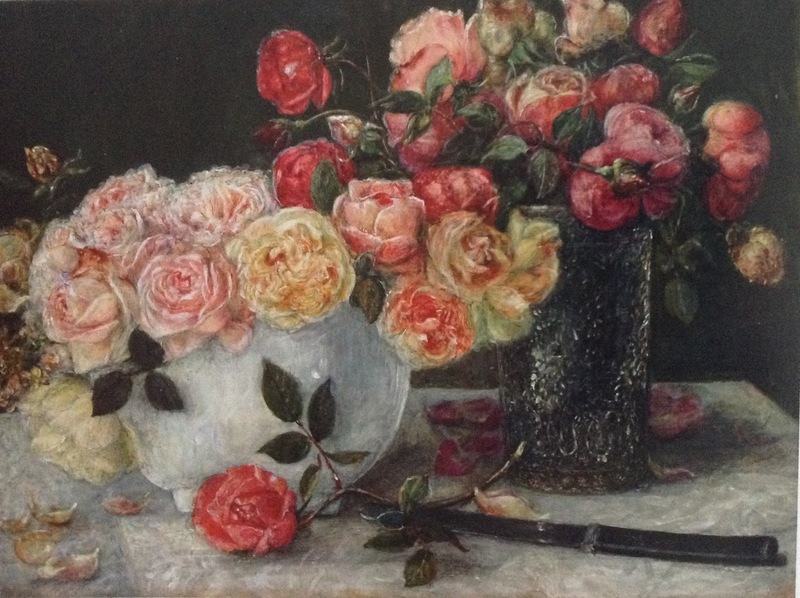 It was such a beautiful grave that I had to find out more and I brought you the story of a woman whose talented children honoured her with their art. Obviously, as it's me we ended up in an asylum again, but when you read the story of Mary Ann Gibbons, I defy you not to be deeply touched. 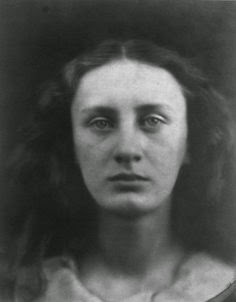 An awful lot of work this year has been towards my new biography of Mary Hillier, maid and muse of Julia Margaret Cameron and I have had enormous fun discovering more and more details about the beautiful face of much of Cameron's work. I love a mystery and so when Mr Walker asked me to find out more about the Russell-Cotes copy of the George Richmond portrait of Charlotte Brontë, how could I refuse? 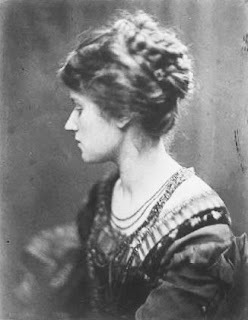 I love digging around to find the answer because the story of how Charlotte's publisher ended up with a copy of her portrait is proper Victorian romance, proving that very few things are as straightforward as you'd think. Actually, that's a pretty good summing up of what The Kissed Mouth blog is all about really. While there are stories to be told, I'll be delighted to tell them and if you have the time, I'd be grateful for your company. Hurrah, I'm five! Kisses all round! or at least that is what they were told when they bought it. Look familiar? 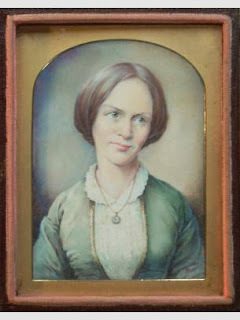 Until the 1990s the picture was taken at its face value, that it was a copy of the Richmond picture, done by Richmond at around the same time as the original. It was suggested that possibly it was the original Richmond picture but herein lies the keyword for today's post: provenance. 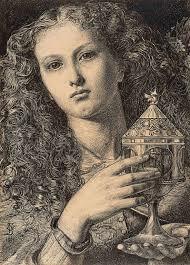 In the past I have identified works of art for various institutions and so when Mr Walker asked me to find out more about the Russell-Cotes' picture I was happy to take up the challenge but what you really need is a clear path of provenance. 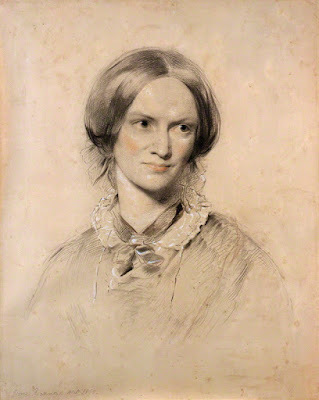 The National Portrait Gallery undoubtedly have the original picture as their picture has a nice path from Charlotte Brontë to her father to her husband to her husband's second wife's head to the NPG. 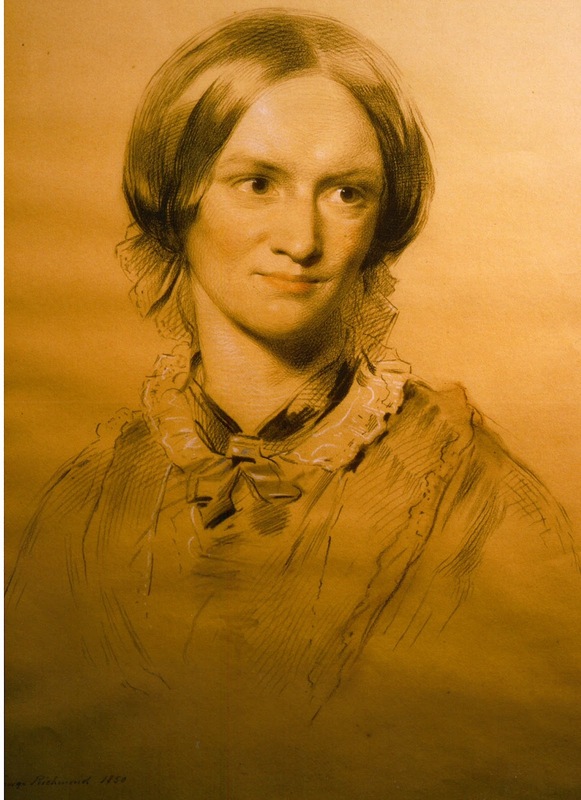 Unless the pictures were swapped at any point, unless multiple copies were made and distributed for some unknown reason (and kept secret until now) then we can be fairly certain that the NPG own the official portrait of Charlotte Brontë done by George Richmond in June 1850. Nor is Richmond's portrait the only 'lone' picture of Charlotte, as the Brontë Parsonage also owns this offering. A particularly doll-like Charlotte seems to be looking for someone, as does her dog. Is it her own mortality slowly creeping upon her as she waits in her mourning clothes...? Sorry, at it again. 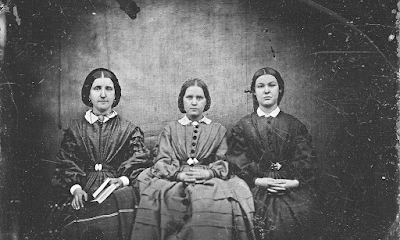 I have a particular fondness for photographs of the Brontë Sisters, or Les Souers Brontë, as one of these is French (as these things tend to be). 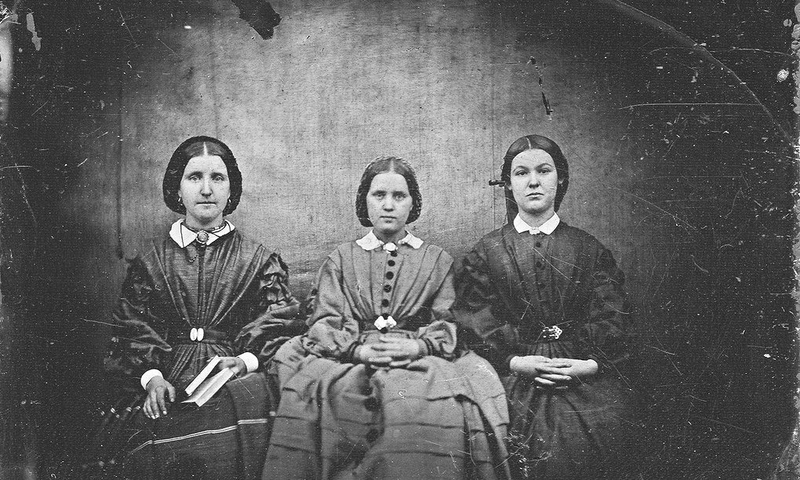 Although they are lovely photographs, especially the top one, neither has any provenance at all or any compelling arguments other than 'wouldn't it be smashing if these were the Brontë Sisters?' 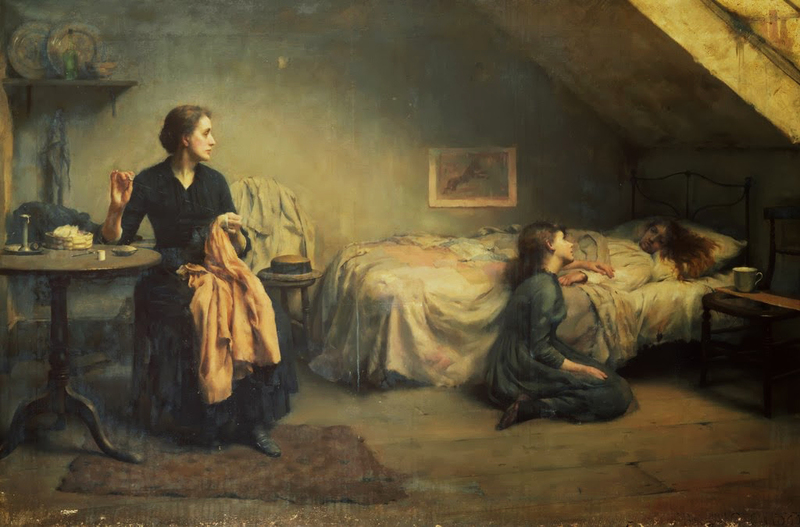 The top photo is particularly gorgeous and dramatic and much has been made of the fact that the figure of 'Charlotte' on the left looks like her portrait but I'm sadly not at all convinced. Gorgeous image tho'. Look at the spaniel-shine on 'Anne's' hair on the right. It's very staged, and if you told me that it was by Oscar Rejlander, I wouldn't be surprised. 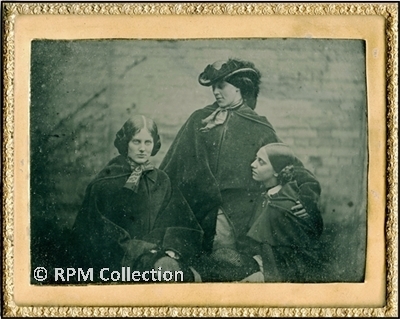 As for the bottom image it's more like a family portrait of the 1840s or 50s but the women in the lower image look more like a mother and two daughters. Bright Morris (1844-1912) lived for a while in Capri and was a respected painter of landscapes and still life. 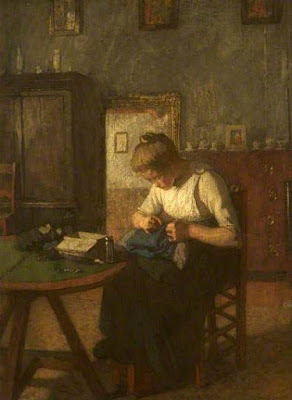 In 1909, he made a copy of the Richmond portrait which is now owned by Newnham College, Cambridge. 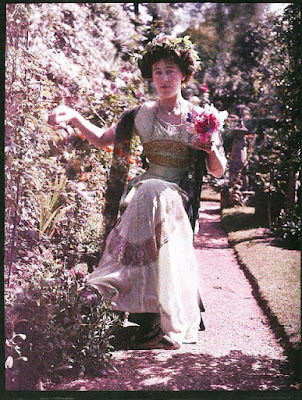 For obvious reasons, the 1909 Charlotte looks very much like the Russell-Cotes' Charlotte but most notably the signatures were the same, apart from on the Cambridge copy it read 'after George Richmond 1850'. In the Russell-Cotes version, the 'after' is missing. This seemed to be enough to say that Bright Morris must also have created another copy that made its way to a Bournemouth auction room in 1969. So what do we derive from this? 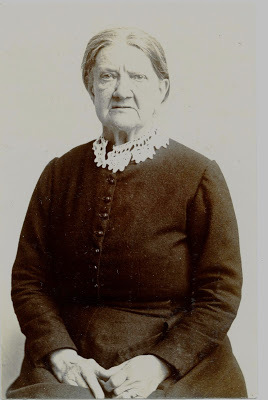 Unfortunately we do not have George's original letter to her so we don't know if he had obtained the copy in 1850 or had intended to do so shortly after. What seems apparent from Charlotte's letter is that he was intending to have the copy made by a respected artist, hence Charlotte's remark that it would be valuable despite being of her, bless her. I think possibly that Smith was intending to have a copy done but the reassurance from Charlotte that he would eventually own the original made him delay his plan. 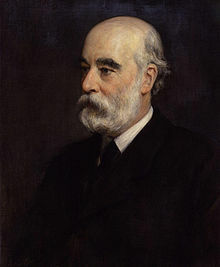 There is a letter from him to Ellen Nussey, a friend of Charlotte's, in 1869, stating that the museum in South Kensington (now the V&A) had managed to find out Charlotte's widower's address in Ireland in order to borrow the Richmond picture for an exhibition. If Smith had indeed had a copy done in 1850 then it would have been easier for the museum to borrow his portrait than find out Mr Nicholl's and borrow the original. So what is the answer? 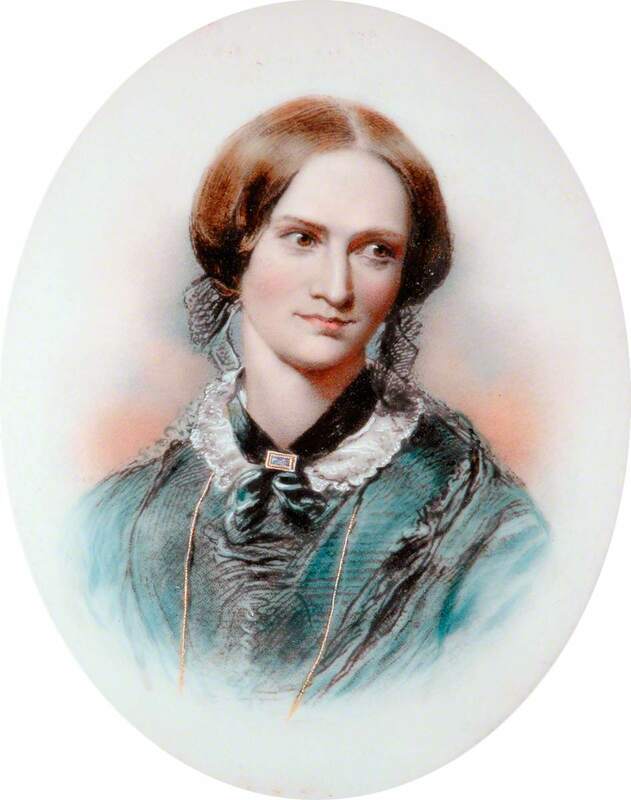 Well, as the auction house in Bournemouth could offer no provenance when requested in 1993, then we can't be certain but the narrative that seems to offer itself is that the Bournemouth Brontë is probably George Smith's copy of Richmond's original. We know from the 1895 newspaper article that he owned a Bright Morris copy, although without knowing more of Mr Bright Morris, we don't know when that copy was done. As William Bright Morris was born in 1844, this backs up the idea that if he did George Smith's copy then it wasn't done in 1850. 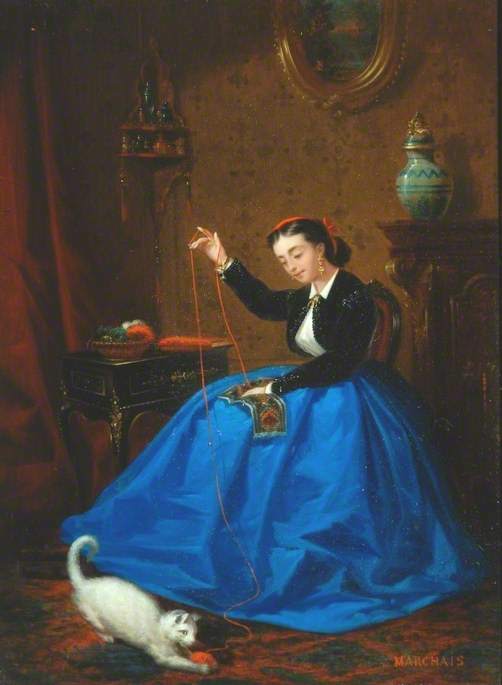 I would even venture to suggest that if Smith is not in possession of a copy by 1869 (as suggested by the South Kensington Museum's use of the Richmond original), then it was done somewhen between 1869 and 1895, possibly prompted by the arrival of the original in London for the South Kensington exhibition. If I had to guess, Smith got Bright Morris to copy the portrait around this date and then Bright Morris did a further copy of it in 1909 which resides in Cambridge. So what is the lesson of today's post? 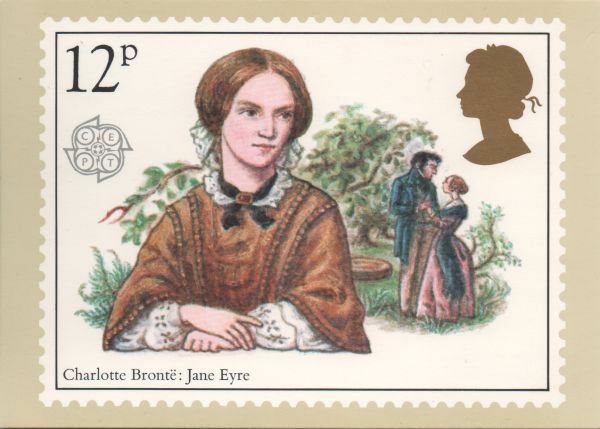 Well, after 200 years, our love of the Brontë sisters is so strong that we long to know more and being such visual creatures we need to see them. 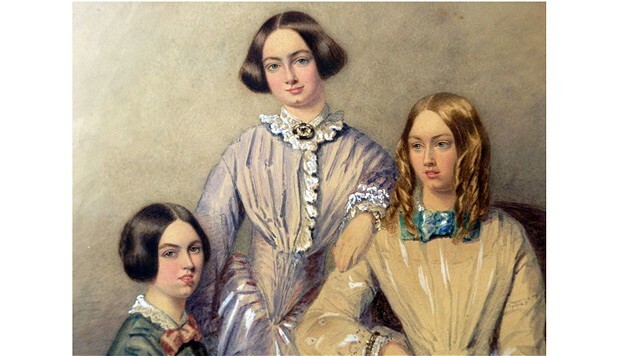 I think it is interesting that of late the alleged portraits of the Brontë sisters have been photographs, acknowledging a problem that Charlotte felt herself - paintings can often flatter or change the appearance to what we think a person should look like. 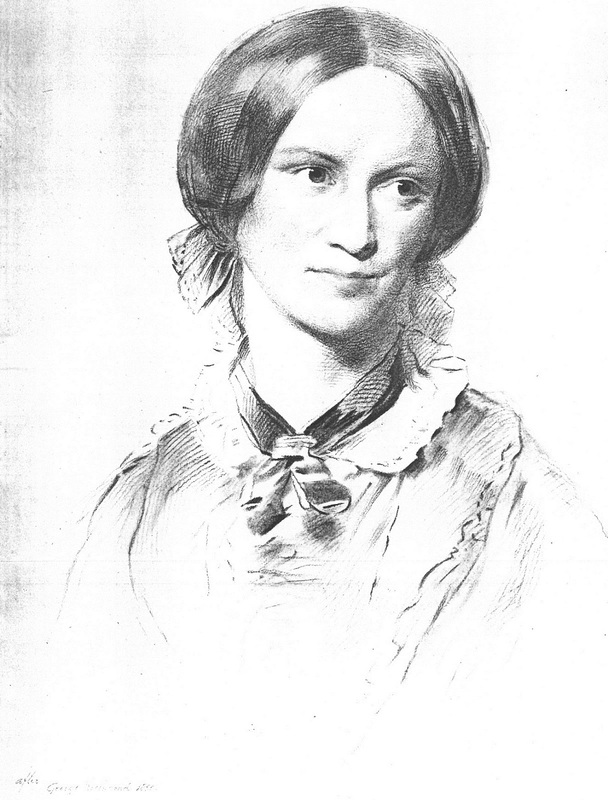 Looking at the progression of 'portraits' of Charlotte after the Richmond image they change small details making her look more romantic, putting a blush in her cheek, a book in her hand. I think George Smith wanted a straight copy of Richmond's work which is why it would be tempting to think that Richmond himself made the copy. As it is more likely another artist, presumably William Bright Morris, made the copy then the fact that it is so identical to the original (so much so that an expert felt it was by Richmond) tells us something about Smith and Charlotte. 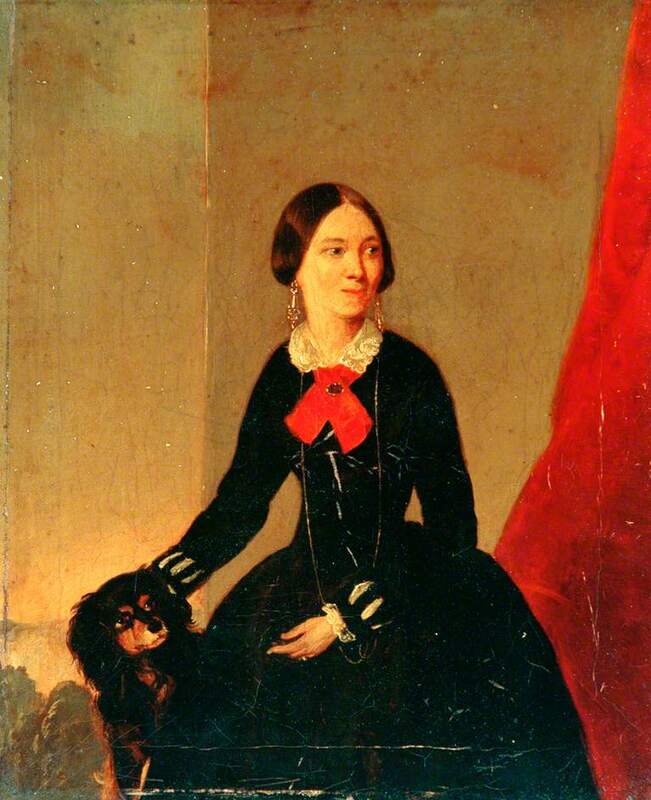 Whilst Richmond's portrait might not have been an exact portrait of Charlotte, the picture was a moment in time, the capturing of a likeness of his dear friend of whom he was obviously very fond. In making the copy, Smith is not only recapturing a good work of art but also the spirit of 1850 when the world had opened up to Charlotte Brontë in a way that had been denied her and was ultimately not to be. 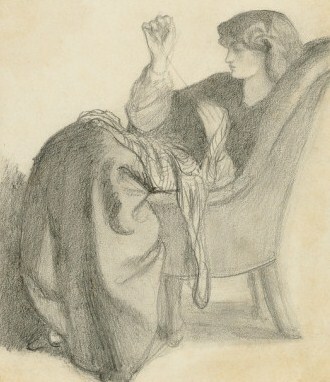 In 1850, after the deaths of her brother and two sisters Charlotte had been superficially freed from Haworth, travelling to London and beginning a new literary life. 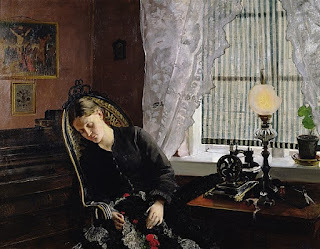 As her happiness was not to last, it is unsurprising that Smith wanted to freeze her in 1850, the bright, young novelist with her whole life ahead of her. 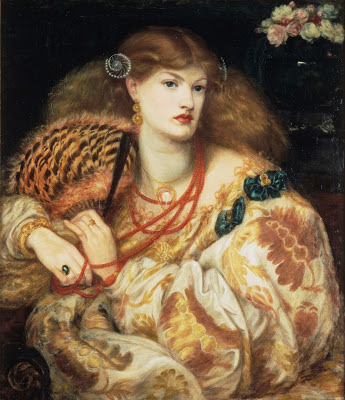 Splendid Lecture at Leighton House - Special Offer! 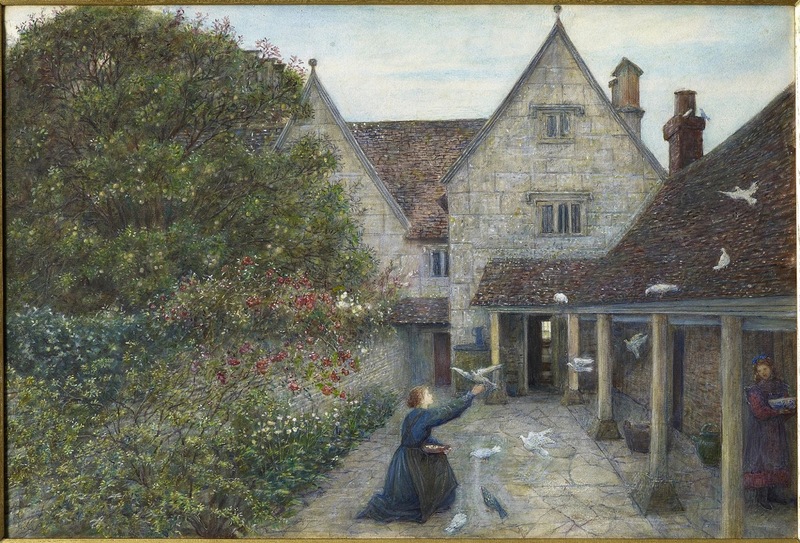 Taking place on Thursday 21 April, independent art historian and curator Christopher Newall will explore the various purposes for which drawings were made in the Victorian period; from works that were to be seen and sold, to private meditations, personal to the artist. The Lecture starts at 7pm but there is chance from 6.15pm to look round the exhibition Pre-Raphaelites on Paper: Victorian Drawings from the Lanigan Collection. Tickets are normally £15 but because we're all chums you can get in for £10, which includes entry to Leighton House Museum, complimentary drink (huzzah!) and entry to the lecture, obviously. Enter promotional code SPECIAL10 when booking here. If anyone asks, say Mrs Walker sent you and wink. Although it was released back in 1979, I have to admit the only bit that seemed dated to me were the credits, as once we are thrown in, it doesn't jar in the way that some period dramas do. Mind you, if you consider Isabelle Adjani went on to film one of my favourite period dramas, La Reine Margot, maybe the French are just good at making period film that feel timeless. No false eyelashes and inappropriate make up here. Everything is absolutely beautiful. And bleak. Really, really bleak. Blimey, but everyone is everso lovely in the film, especially the ethereal Anne, who out of the three sisters could easily be overlooked as she didn't write either of the Brontë novels that people can immediately name. I have the impression that del Toro must have been aware of Huppert's styling in the film when bringing Edith Cushing to the screen (in Crimson Peak) or conversely the stylist for Les Soeurs Brontë also really like Millais' The Bridesmaid. The film opens with Branwell completing the famous portrait of the sisters and himself, and it becomes immediately obvious that the family exists in a restricted space, all huddled together while the darkness gathers (much like in the painting). 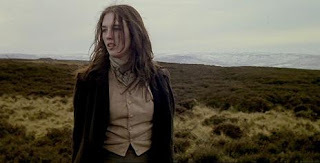 Emily pulls on trousers and scrambles over hill and dale, outraging elderly family members, but ultimately getting nowhere and returning to the parsonage. 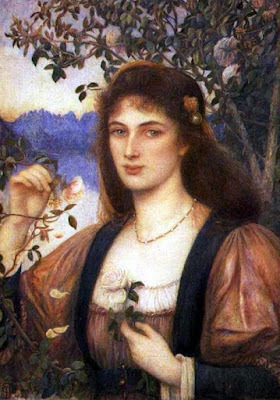 I particularly liked the scene where her sister shows her a beautiful wild rose which Emily spurns in favour of the holly, which will last longer. Just to prove her point, she stomps all over the rose. Nice. 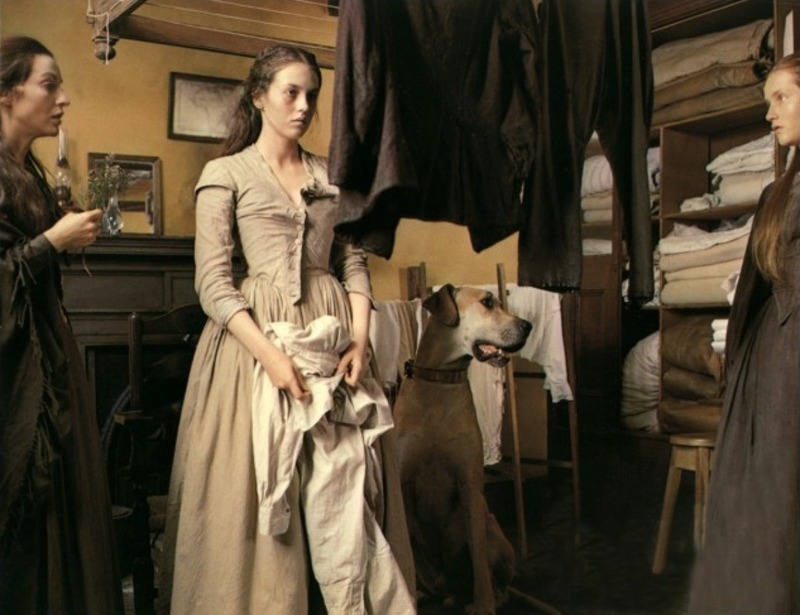 We follow the sisters to Brussels, and to the home where Anne was the governess, but always back to Haworth, to the tiny parsonage which seems cold and quiet. The sisters are often shot with their backs literally against a wall, their costume different from the people around them (most extreme example of this being the opera scene at the end of the film). 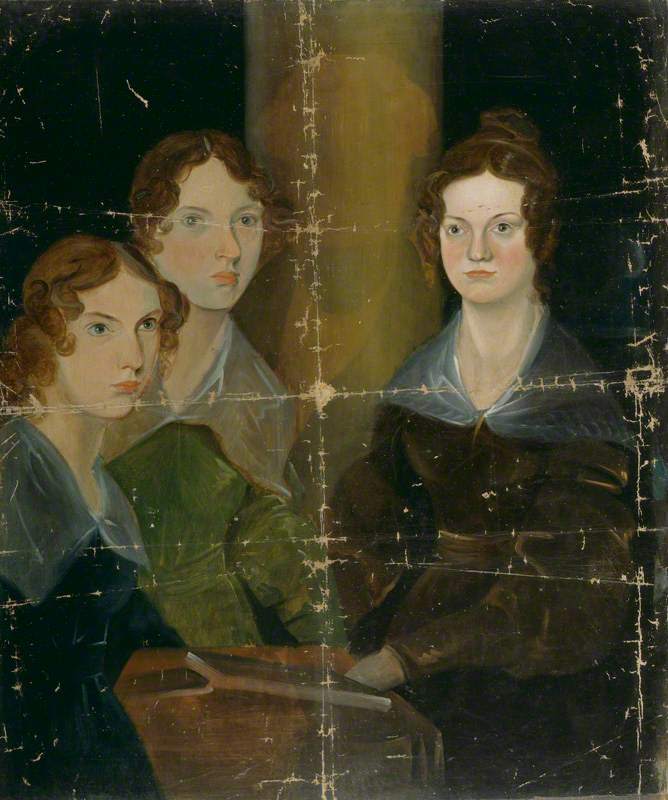 There are many scenes at night where the Brontës are crammed into the space carved for them by a guttering candle. There is an ever pervasive feeling of confinement, difference, captivity. The Brontë sisters are dressed beautifully, like little dolls, their diminutive size emphasised by their frankly massive dog. 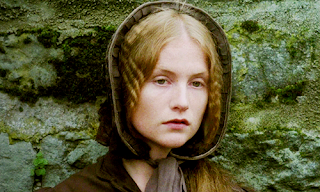 Branwell's descent into misery and failure is marvellously brought to screen by Pascal Greggory and his cheekbones. 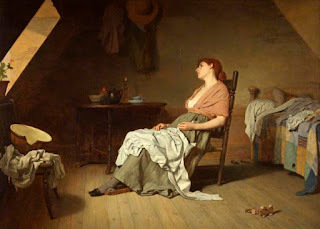 He manages to combine all the self-indulgent moping, drinking and more drinking of Branwell without being irritating, even when he sets his bed on fire. For heaven's sake. His profound inability to get away from Haworth is played as a very obvious foreshadowing of the sister's fate in a way I had not considered, and his demise (come on, that's not a spoiler, surely?) sets up the final part of the film. Possibly my favourite moment of the entire film, just for its sheer bleakness, has to be the sisters reading appalling reviews of Wuthering Heights out loud while Emily scrubs the scorch marks off Branwell's wall. Stunningly gothic. 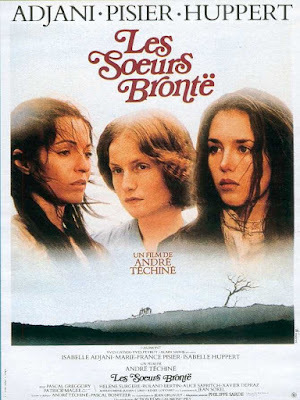 Les Soeurs Brontë (1979) is available from shops and the interweb now. Although mine was a French edition, the subtitles were easy to find.